Keep in mind that your landscape is an investment that will actually be reflected in the value of your property and extremely too important to overlook. 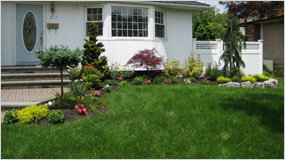 Lakeview Landscaping provides complete landscape design and construction services to increase the value of your home. We will design a unique look for your property which conforms to your standards, pricing structure and desires. We take a design, create a reality, and then maintain it in the years ahead.